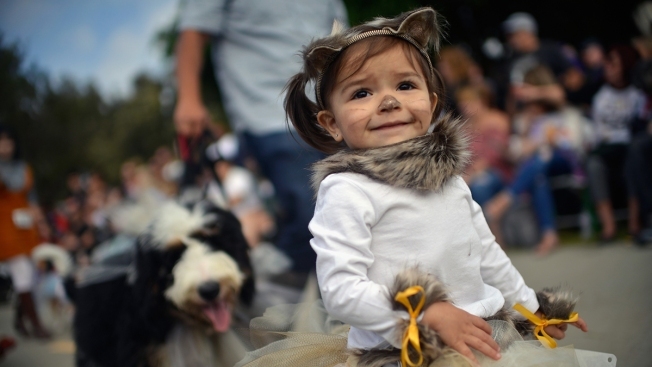 A child in costume walks in the Haute Dog Howl'oween Parade on Oct. 29, 2017, in Long Beach, California. Shopping for Halloween costumes doesn't have to be scary. This year, shoppers can find more ways to save time and money. Discounters like Walmart and Target are expanding their costume offerings and creating designated sections where customers can find more of their Halloween needs in one place. And for the first time, Party City is offering an assortment of Halloween costumes on Amazon. Party City and others are either revamping their apps or launching new ones to make shopping easier. And of course, pop-up shop pioneer Spirit Halloween, the largest Halloween store franchise, is a reliable option. It now has about 1,400 temporary locations in the U.S. and Canada, with more of a presence in the malls. Meanwhile, crafts chain Jo-Ann Stores Inc., is now catering to procrastinators with a bigger assortment of ready-made costumes. "More retailers are getting into the game," said Marshal Cohen, chief industry adviser at NPD Group, a market research firm. "Stores are creating broader assortments. And you can get an instant costume from start to finish." Halloween costumes are a big business for retailers. Americans are expected to spend $9 billion on Halloween, slightly down from the $9.1 billion spent last year, according to a survey by the National Retail Federation, the nation's largest retail trade group. The 2018 spending estimate includes $3.2 billion on costumes, according to the survey. Goodwill says Halloween is its biggest season in terms of sales. Last year, Target launched a Halloween destination called Hyde & Eek where customers can find Halloween decor and costumes all in one place. It added candy to the shop this year. It also increased its costume assortment by nearly 30 percent. Online, the bulk of the prices for Halloween costumes range from $15 to $50. Walmart is also pulling together more Halloween items into one destination. It used to only have costumes, decor and makeup in one section; now, it's adding Halloween candy. And for the first time, Walmart created an online shop in the beauty section to help customers find complete makeup looks for Halloween costumes inspired by DC comics, including Wonder Woman or an Ice Princess. Stores are revamping their apps or adding new ones to make it easier to shop for Halloween costumes — and to share. Jo-Ann's revamped app allows shoppers to share their Halloween costumes with friends on social media. And Party City launched a new app called Spookify that lets customers virtually try on their costumes and makeup. If you don't need to get the hottest costume of the season, it's best to shop right before Halloween to get the best deals of the season. Discounts can be up to 50 percent. But as NPD's Cohen says, "Truly the best time is right after Halloween and store it for next year." That's when costume prices are slashed by 75 percent. Go to your closet and you'll most likely find leftovers from past Halloweens such as a witch's hat or a feather from a flapper's costume. Or turn your regular clothes into costumes. Shoppers should also turn to thrift stores like Goodwill, which offers both used and new Halloween costumes. Goodwill's website has a special page devoted to Halloween. The site offers makeup tutorials and shows how shoppers can create a costume with up to three items from the thrift chain. Shoppers can purchase a costume in its entirety including wig, shoes, and headbands for an average price of $30, according to Lauren Lawson-Zilai, a Goodwill spokeswoman. You don't have to have the skills of Martha Stewart to make your own costume. Get ideas from Pinterest or Etsy, or go to the online sites of Jo-Ann's and Michael's for ideas. Jo-Ann's has broadened its assortment to include more ready-made accessories like tutus. On Jo-Ann's online site, customers can find costumes that can be made in an hour or take three weeks and it separates the project by age and skill level.